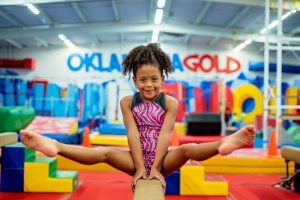 Gold Nuggets is a 55-minute invitation only, accelerated gymnastics program for more advanced gymnasts. It is a pre-team oriented program designed to teach team-level skills. Girls in the Gold Nugget program may achieve the opportunity to advance into the Amateur Athletic Union (AAU) competitive level programs. Our coaches are constantly evaluating their students to make sure each child is being challenged in the class. If a coach thinks a child is ready to move up to Gold Nuggets from their Level 2 class, the coach will let the parent know that it is time to move up a level.